Made of stainless steel which guarantees High strength and hardness,solid and durable, perfect to keep as a daily jewelry. If any inquiry or problem with our product, please contact us and we will offer a satisfying answer. Worry-free Return and Exchange: We accept return or exchange for any reason ,so please feel safe to order. For more details, please contact us. Material: High Quality Stainless Steel, Hypoallergenic and Comfortable to wear. 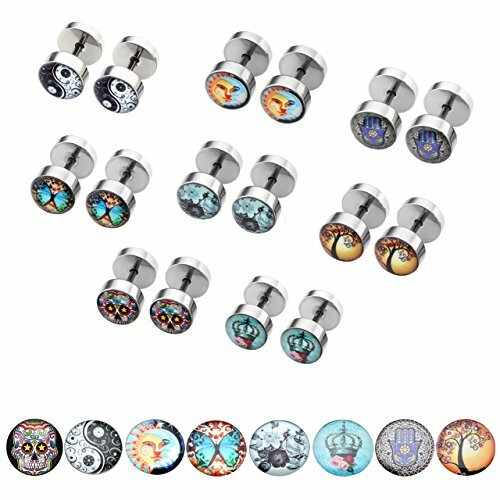 Quantity: 8Pairs(1 Pair for each design)+ Gift Box; You can one different studs everyday to match you mood and outfit.